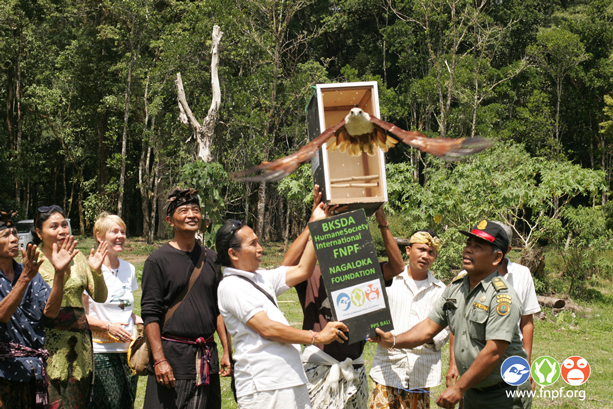 Smuggled birds of prey seized by government and cared for by Friends of the National Parks Foundation (FNPF) returned to the wild after traditional Hindu blessing release ceremonies in the Bali highlands. Born to be wild, confiscated birds of prey cared for by veterinarians at the FNPF Bali Wildlife Rescue Centre are being released to freedom inside protected forest sanctuaries, in the mountains of Bali. To the tune of traditional ceremonies captured Changeable Hawk-eagles and Brahminy kites endemic to Southeast Asia returned to the wild at Bali Wildlife Sanctuary and the tranquil shores of Lake Tamblingan. Bordering UNESCO World Heritage-listed cultural landscape site, the famed Subak rice terraces – the Bali Wildlife Sanctuary was established by FNPF in 2011 on the slopes of Mt Batukaru in collaboration with local villagers who enforce traditional regulations ensuring the safety of wildlife within this protected zone. Part of Bali’s largest remaining forest, the sanctuary is home to Leaf monkeys, macachi, and many species of birds and spans an area covering 5km in radius from famous Besikalung Temple. “I am very pleased that the Hawk-eagle release was successful,” says Friends of the National Parks Foundation (FNPF) Founder and CEO, Dr Bayu Wirayudha, who works closely with wildlife rangers from Department of Forestry’s Natural Resources Conservation Agency to rehabilitate poached birds back to native forests. “On the second day the bird was able to catch a lizard from the ground, as well as a bird. The hawk eagle moved away from the release area on the third day, which is a good indication of a successful reintroduction into the wild,"Dice il Dott. Wirayudha. Friends of the National Parks Foundation successfully released the bird after a special Hindu ceremony to receive blessings from the Gods, before setting the eagle free. At the most recent ceremony at Munduk on mountainside Lake Tamblingan in Bali’s north, the village priest received permission from dragon spirit Nagaloka, protector of the sanctuary declared by local villagers who manage the ancient forests with traditional lore. Legends of the Naga live on and local people are constantly reminded of their ties to nature with the presence of the dragon that lives in a mountain cave above the lake, says Traditional Village Leader Putu Ardana. “I will continue to remind the people around here to take care of the existence of the Brahminy kites and reduced community activities that damage the biodiversity”, said Putu Ardana, who explains the local people have ancestral ties as far back as 900 AD evidenced by the discovery of ancient stone script reliefs dated to that period. Aquilone Brahminy (Haliastur indus) populations are declining and in Indonesia, while not endangered, the birds of prey are vulnerable to poaching and smuggling, as well as rapid habitat loss. Shrinking populations of this bird of prey – Changeable Hawk Eagle (Nisaetus cirrhatus) - is attributable to the damage of its habitat, poaching and illegal shooting both in Indonesia and in the Philippines, where it was once abundant. Another smuggled Changeable hawk-eagle is in rehabilitation preparing for wild release at Bali Wildlife Sanctuary, Besikulung, in Tabanan region, su 10 September – after being confiscated from illegal wildlife poachers by the Department of Forestry’s Natural Resources Conservation Agency. About Bali Wildlife Rescue Centre – Tabanan, Bali: One of only seven wildlife rescue centres in Indonesia, Amici della Fondazione Parchi Nazionali (FNPF) operates Bali Wildlife Rescue Centre to care for, riabilitare e rilasciare nativo in via di estinzione della fauna selvatica – the victims of illegal trading and poaching. The centre is currently home to 50 primati in via di estinzione e uccelli, including gibbons, macaques and eagles – most rescued have been kept as pets or for entertainment. FNPF manages Bali Wildlife Rescue Centre with funding and support from the Humane Society International (Australia).